As previously discussed on this site, the NDP is on the rise federally. We got a new Ekos poll, as well as a Forum and a rare Angus-Reid. They all confirm Mulcair and his party are first and would be favorite to win an election tomorrow. 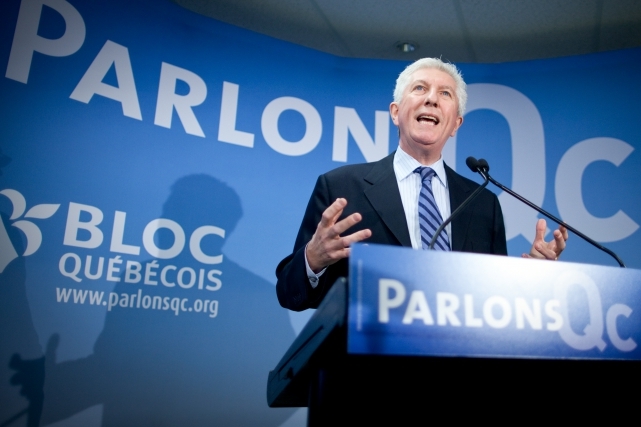 Forum and Ekos also agree that the Bloc is up after the return of Gilles Duceppe. However, his comeback doesn't make everyone happy. I'll get back to this late further down. Doing projections outside of an election period is tricky. We have few polls, they are released with gaps in between and not all firms provide some. In particular, Forum and Ekos are more active and these are two firms who tend to have the Liberals and/or NDP slightly higher. All that to say that you need to remain cautious. Nevertheless, let's average these three polls and see what we get. The detailed, riding-by-riding projections are here. As usual, you can use the simulator. As you can see, the NDP would be favorite to win the most seats. A majority is still out of reach and it's mostly because of Ontario. While the party is definitely higher there than in the past (including 2011) and actually first in some polls, its vote is still too inefficient to win the most seats. If I only use the Forum poll (more favorable to the NDP), I get that the NDP has a 0.2% chance of getting 169 seats or more. Using the average? 0%. If there isn't much uncertainty regarding a majority (for any party), the race itself is wide open with all three parties potentially capable of forming the next government (assuming whoever wins the most seats gets to do that, which isn't a sure case this time around). It's obviously a very long shot for the Liberals right now, but not impossible. Quebec in particular is a battlefield with the Liberals, Bloc and NDP pretty much all tied statistically and the Conservatives not that far behind. The Bloc is definitely up and is now sitting around 25% thanks to the return of Duceppe. The question obviously is to know if this party will remain there (or even climb higher). Ekos has interesting data about that. When asked in they were more or less likely to support the Bloc, you actually have more people who said less likely (38%) than more (27%)! This might seem contradictory with the fact that this party is up. Breaking this down by party, we see that Bloc voters are much more likely to vote Bloc with Duceppe as leader (63% more, 20% less). On the other hand, Conservatives are significantly less likely (56% less, 10% more). So are the Liberals and NDP. What this shows is that the people for whom Duceppe's return could influence their vote have already switched back to the Bloc. Also, keep in mind that there is a difference between being less likely to support a party and actually not supporting it. Some voters might have preferred for Beaulieu to stay (and/or Duceppe not to return) but they'll still vote Bloc. These numbers do show however that Bloc supporters shouldn't expect this bump to push them much higher than 25%. There isn't that much potential left, if at all. I suspect that the Bloc will be back to 20% relatively soon but this is purely a guess. The Bloc is now projected with between 7 and 28 seats. They are back to being competitive in many ridings (if you look at the pdf, there are only 21 ridings where this party has 0% of winning). The NDP is still favorite to win the most seats in la Belle Province (over 90% chances) but their lead is shrinking. Some ridings have a four way race. For instance Louis-Hébert. The NDP is clearly feeling the impact of Duceppe's comeback. Indeed, Quebec is now their worst province! They are above 30% in every other one, which is pretty crazy if you think about it. Over the last few weeks, they have in particular increased significantly in the Atlantic and in Alberta. The former being really bad news for the Liberals as it means they are losing ground in the one region they were dominating. Speaking of the Liberals and Justin Trudeau, the situation isn't hopeless. At the same time, there is no denying that they are losing steam and it remains to be seen if the recent announcements of comprehensive reforms (including the electoral system) can really change their fate. At least the fall appears to have stopped if we are to believe Ekos. The Conservatives have been running negative ads against Trudeau for some time now. I'm really curious to see if they'll start attacking Mulcair more. Right now, Harper and the CPC are still in a relatively good position. They could well win the most seats thanks to a vote that is more efficient. One has to wonder how they could realistically govern with such a small minority (under 120 seats) and with LPC+NDP having a majority. We already know (from other polls) that the NDP and LPC voters are okay with a coalition and their second choices explain why. Indeed, among Liberals, 42% have the NDP as second choice and only 11% have the CPC (36% have no choice). For the NDP voters, it's 40% Liberals as second choice, 15% Green and 31% none. So really, Liberals and NDP do share a pool of voters. Notice however a big difference between these two groups. Forum consistently shows that while Liberals supporters have a positive perception of Mulcair, it's not the same for Trudeau and the NDP voters. In conclusion, the NDP continues to confound expectations by being first. Gilles Duceppe's return might mean less seats in Quebec, but thanks to increases in other provinces, that might not matter much. BC in particular looks very promising for Thomas Mulcair. Do the Liberals really need Quebec to win the next election? In his latest piece, John Ibbitson from the Globe and Mail argues and shows that the federal Liberals can't expect to form the next government without a big drop of the NDP in Quebec. While his math seemed to add up, I decided to take a look myself. For this article, let's forget some of the recent polls where the Liberals can be sometimes as low as 23%. Obviously a party finishing third in the popular vote, almost 10 points behind the top party, can't expect to win the most seats. You don't need math or a complicated model to show that. Instead, let's see how high the Liberals need to be outside of Quebec in order to win the next election. The nice thing for this exercise is that I don't need to make up all the numbers. I can simply take a look at the polls of a couple of months ago when Trudeau and his party were actually polling first (and I'm not even talking of the polls last year that had the Grits on a path to a majority). Take this poll from Forum of last week actually that had the Liberals first with 32%, 1 point ahead of the Tories and 4 of the NDP. This is a poll that could be within the margins of error of the most recent poll average. The problem obviously with this poll is that Trudeau and his party were quite high in Quebec and that goes against what we are trying to do. So let's keep the results outside of Quebec and replace the percentages in la Belle Province by the ones of the most recent Crop (mentioned by John Ibbitson; Notice however that this poll was done before the return of Gilles Duceppe. I cover this below). Take the numbers, put them into the simulator and what do you get? The Tories with around 110 seats, the LPC at 100 and NDP at 120 (if we round everything). So sure, Trudeau doesn't become the next PM. But we are using a scenario where the Liberals do very average everywhere outside of the Atlantic. In Ontario for instance, the numbers from Forum have this party at 33%, barely ahead of the CPC and NDP (31% each). If anything, these numbers are incredibly good for the NDP, especially in Ontario. And they aren't close to the "best case scenario" used by Ibbitson. Let's compare quickly. In Atlantic, these numbers would give 29 LPC, 3 NDP. The CPC is wiped out. This is very similar to Ibbitson' scenario. 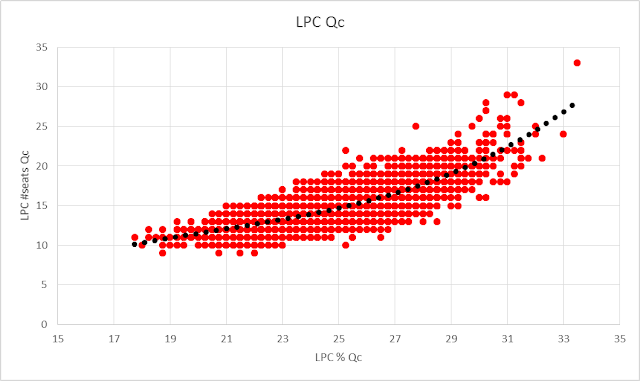 In Quebec, he gives the LPC 10 gains, my simulation only 4 So I'm actually harder on the Liberals there. Ontario, 14 seats for the Grits last time (with the new map), 47 this time around based on my numbers. Ibbitson gives them 26 gains (on the old map), my model 33. Even taking the new seats into account, I'm slightly more generous with the Liberals there. 6 gains in the Prairies and Alberta for Ibbitson, I actually only give them 4. Finally, in BC, my simulations increase the number of seats for the LPC from 2 to 10, compared to 6 in the old map in the Globe and Mail article. Overall, my relatively "average scenario" is quite often less good for the Liberals than the one of Ibbitson, including in Quebec (it is however better in Ontario and BC). But my 104 seats aren't far from the 109 he had. But again, my scenario isn't a best case one. It isn't even an objectively good one for Trudeau. In many provinces, the Liberals would be in line (in terms of votes) with 2008 for instance. We could debate whether the Grits can hope to do much better than 2008, but I don't think that this election should represent the best scenario for this party at this point. So, what is needed for the Liberals to win from there? Do they really need Quebec? It'd obviously help a lot to get more than 12 seats in the French province. The problem is that we need the NDP to fall a lot and the Liberals to increase significantly before the seat gains are important. Remember the Liberal vote in Quebec is concentrated in Montreal. So unless Trudeau can become first or close to first in terms of votes, Quebec will at best provide another 8-10 seats. In a close election, that could well make the difference. Could make the difference in a close election but far from optimal. If anything, if the NDP falls in Quebec, the Bloc will benefit from it. With Duceppe back, some soft NDP voters could go back to the Bloc. So a NDP collapse there would most likely benefit the Bloc, not the Liberals. The recent Leger poll shows NDP voters' second choices are evenly split between LPC and Bloc. So what's left? The answer: Ontario. Remember that the poll I based my simulations on had the NDP at 31% in Ontario. That's much higher than their 2011 results. So let's put the NDP back at 25% there. Let's also give this province to Trudeau, winning it 37% vs 34% for Harper. So pretty much going back to the 2006 results. With this modification, the Liberals now win the election with 114 seats, 3 more than the Conservatives and 2 more than the NDP. Let's illustrate the potential of Ontario versus Quebec in two graphs. They both display the possible outcomes (number of seats) for the Liberals as a function of the percentage of votes received in each province. In other words, the horizontal variation is when the Liberals increase or decrease their shares of votes, while the vertical variation (for a given % level) represents the uncertainty of the electoral system (two scenarios with the Liberals at 25% in Quebec won't give the exact same number of seats as it depends on the other parties, the efficiency of the vote, etc). The trend line shows the average number of seats for every possible percentage level. As we can see, getting more votes obviously leads to more seats in average. Nevertheless, let's compare the effect of a 10-points increase in Quebec and in Ontario. In the former, moving from 21% to 31% allows the Liberals to gain roughly 10-12 seats (from 12 to 23 approx.). 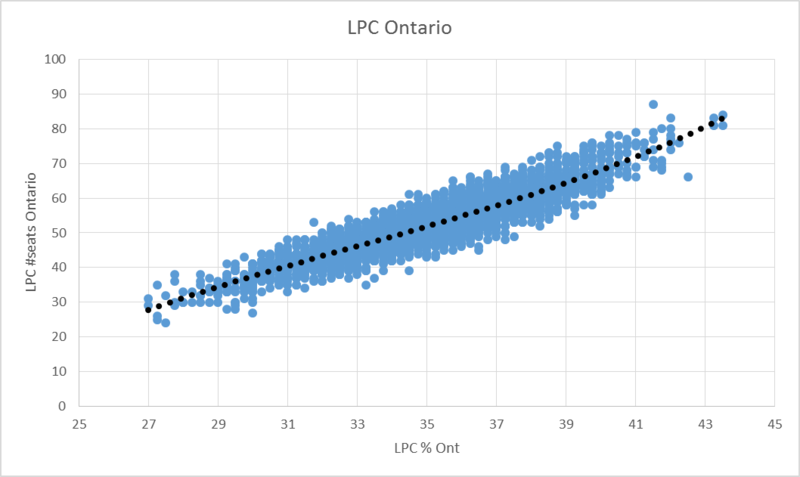 In Ontario, moving from 28% to 38% allows the Liberals to gain 30 seats (from 30 to 60). These graph should make it very clear that if there is one province where Trudeau needs to increase, it's Ontario. The potential for seats in Quebec simply isn't there. It'd be there of course if the Liberals could climb to 35-40% in Quebec, but this is highly unrealistic. Once again, if the NDP was to fall that bad, the Bloc would benefit just as much as the Liberals. As pointed out by Darrel Bricker (from Ipsos) in the article, if you want to win an election, it's nice and almost necessary to have at least one region where you dominate and win pretty much all the seats. The Tories have Alberta, the NDP probably will have Quebec. The Liberals have the Atlantic. The 30 seats in the Atlantic for the Liberals is very comparable to the 30-33 seats guaranteed for the CPC in Alberta. At this game, the NDP might have a head start, but it doesn't mean the Liberals can't win. What is true however is that as opposed to the Tories, the Liberals can't dream of majority without a good showing in Quebec. Five months before the election though, a majority seems out of reach of any party. So let's forget about it for now. At the end of the day, I simply disagree with the statement that the Liberals can't win without a drop of the NDP in Quebec. This is simply not true. Not only would such a collapse most likely benefits the Bloc just as much (if not more) than the Grits, the province that Trudeau absolutely needs to win (and needs the NDP to remain low there) is Ontario. Even by winning only 10-15 seats in Quebec, Trudeau could get 115-120 Canada-wide and for this election, that could well be enough to become PM. L'annonce du retour de Gilles Duceppe a été toute une surprise pour beaucoup, moi inclus. Et voici le premier sondage après cette annonce. Le dernier Léger montre que le retour de Duceppe semble considérablement aider le Bloc (pdf détaillé ici). En effet, ce dernier est en hausse de 10 points (par rapport au précédent Léger du mois de mai). À 26%, c'est le plus haut résultat pour cette formation depuis bien, bien longtemps. Il est intéressant (et quelque peu surprenant) de découvrir que le NPD est en fait en hausse également (1 pt, donc pas significatif). Je dis surprenant car avec la remontée du Bloc, on aurait pu s'attendre à ce que le NPD en souffre. Cependant, rappelons-nous que le NPD est actuellement en forte progression partout au pays. Il est ainsi possible que le NPD ait gagné des appuis des Libéraux (et Conservateurs) mais ait perdu quelques votes au Bloc. L'effet net étant de faire du Québec une course à deux entre les Néo-Démocrates et les Bloquistes (les Libéraux restent en embuscade cependant, même s'ils n'ont pas vraiment le potentiel de remporter le plus de sièges). Si l'on compare au plus récent Ekos (fait en partie avant l'annonce de Duceppe), le NPD y était plus élevé (35%) et le Bloc un peu plus bas (21%). Soit le sondage Ekos ne mesurait l'effet Duceppe que partiellement (ce qui serait logique), ou nous voyons en fait des variations normales dues à de petits échantillons. Transposés en sièges, ces chiffres montrent encore et toujours que le NPD serait largement favori pour remporter le plus de sièges au Québec. En effet, le Bloc n'aurait que 3.5% de chances de redevenir le premier parti du Québec. En moyenne, le NPD récolterait 45 sièges, le Bloc 11, les Libéraux 14 et les Conservateurs 8 (ils restent premiers dans la région de Québec). Mais les victoires Néo-Démocrates se feraient avec des marges plus faibles (vous pouvez le voir dans le simulateur). Par contre, le Bloc à 26% signifie que cette formation est compétitive dans bien des comtés. L'intervalle de confiance (à 95%) pour les sièges va de 6 à 26. Si on inclut tous les scénarios extrêmes, le Bloc pourrait récolter aussi peu que 1 siège ou autant que 45. Bien sûr, souvenez-vous que ces scénarios extrêmes sont très peu probables. Il s'agît des cas où ce parti ferait beaucoup mieux (ou pire) que les sondages et où son vote serait très efficace (ou l'inverse). Néanmoins, il reste que si ces chiffres se confirment dans d'autres sondages, le Bloc est de retour dans la course. Avec Mario Beaulieu à sa tête, le Bloc alternait dans les sondages vers les 20%, avec parfois quelques sondages le plaçant aussi bas que 13% tel que le récent Forum. En particulier, il était difficile d'imaginer le Bloc redevenir un parti "mainstream" qui pourrait vraiment causer des problèmes au NPD. Mais avec Gilles Duceppe, la situation est fort différente. En même temps, ce n'est qu'un sondage. Il faudra voir si cet effet persiste. Après tout, le Québec est très volatile. De plus, Duceppe peut aider le Bloc, mais il en était le chef en 2011 lorsque ce parti avait subit une défaite historique. Finalement, tel que démontré ici, le NPD reste bien positionné pour remporter le plus de sièges. Le sondage inclut également les second choix et là, on peut voir que le NPD a du potentiel. Ce parti est en effet le 2e choix principal des électeurs des autres principaux partis, incluant les Conservateurs. Pour le Bloc spécifiquement, 32% ont le NPD comme 2e choix. Ce que cela signifie c'est que le NPD peut potentiellement aller chercher des votes chez tous les autres partis, surtout le PLC. En conclusion, ce sondage est de bonne augure pour le Bloc mais il nous faudra attendre confirmation avant de vraiment considérer le Bloc comme un joueur majeur au Québec. Il faut aussi garder en tête que le Bloc (et Duceppe) ont bénéficié d'une couverture médiatique importante la semaine passée. L'effet mesuré ici pourrait être surestimé. Aussi, pas relié, mais le sondage Léger a les intentions de vote provinciales et l'effet PKP ne permet même plus au PQ d'être premier. Le PLQ est en effet en tête avec 36% des votes, devant le PQ à 32%. Les chiffres sont disponibles à la fin du pdf. Les électeurs des circonscriptions de Chauveau et Jean-Talon se rendent aux urnes aujourd'hui afin de remplacer leur député. Bien que quoiqu'il arrive, le PLQ restera majoritaire, ces deux comtés nous fournissent le premier vrai test de l'effet PKP. Quelques semaines après sa victoire facile (mais un peu moins grande que prévue) à la direction du PQ, voici pour lui l'occasion de montrer que le PQ va mieux. Je ne parle pas ici forcément de remporter un ou deux sièges ce soir, mais d'avoir une performance meilleure que lors des précédentes partielles (où le PQ avait bien failli perdre Richelieu en mars par exemple). Histoire aussi de confirmer les deux plus récentes sondages plaçant sa formation en tete (Crop et Leger) à l'échelle nationale. Regardons les deux circonscriptions plus en détails. Soyons clair, en temps normal, il ne devrait y avoir aucun suspense. Selon les plus récentes sondages, la CAQ est à 20%, soit une petite baisse par rapport à son résultat de 2014. Mais une baisse bien trop faible pour lui faire perdre un siège remporté avec... 52% des votes et 22 points d'avance sur le PLQ! Sauf que voilà, la CAQ avait dans Chauveau un candidat vedette en la personne de Gérard Deltell. Son départ pour les Conservateurs fédéraux devrait se faire ressentir. De plus, les sondages placent le PLQ largement en avance dans la région de Québec (ce qui ne correspond pas vraiment à ce que l'on pourrait s'attendre étant donné les pourcentages provinciaux vu que le PLQ est bien plus bas qu'en avril 2014). S'il s'agissait d'une élection générale avec Deltell comme candidat, mon modèle aurait la CAQ largement gagnante avec 50% des votes, loin devant le PLQ et le PQ. Il y a ainsi essentiellement deux questions: a) l'impact du départ de Deltell b) est-ce le PLQ est vraiment si élevé à Québec? Pour la première, je m'attends à un résultat inférieur mais j'avoue ne pas pouvoir vraiment quantifier "l'effet Deltell". 5, 10 points? Étant donné que Deltell avait fais moins bien que Gilles Taillon après avoir repris le comté en 2008 (lors d'une élection où l'ADQ avait été en chute libre cependant) et qu'il avait augmenté de manière similaire à la CAQ en 2012, je crois que l'effet personnel de Gérard Deltell n'est pas forcément si important (il existe cependant). Quant à la 2e question, j'avoue que les sondages qui placent les Libéraux à près de 40% à Québec (alors que ce parti avait récolté environ 38% en 2014 tout en étant 10 points supérieur à l'échelle de la province) me laissent perplexe. Ça n'a pas vraiment de sens. Je crois que les sondages soient sous-estiment le PLQ provincialement ou le surestiment dans cette région. Il faut aussi se souvenir qu'une partielle est bien plus imprévisible qu'une élection générale. Surtout une durant l'été (ok ok je sais, ce n'est pas techniquement l'été mais le soleil me dit le contraire). Au final cependant, je crois que la CAQ devrait conserver ce siège. Cela représenterait une défaite majeur pour François Legault. Quant au PQ, honnêtement, PKP ne pourra permettre à son parti de remporter ce comté. Mais il se doit de faire mieux que le 12% de 2014. Mes projections l'ont à 18%. Étant donné que les sondages semblent indiquer que PKP soit bon à récupérer des électeurs de la CAQ, un score de 20% au minimum est attendu. Ce comté devrait nous fournir davantage d'incertitude et l'effet PKP pourrait permettre au PQ de voler un siège au PLQ. En 2014, ce dernier avait remporté ce comté avec 45% des votes et 23 points d'avance sur le PQ. Les projections actuelles accordent 37% aux Libéraux et 29% au PQ. Le PLQ a aussi 99% de chances de gagner. Cependant, tel que dans Chauveau, ces chiffres sont valides pour une élection générale. Par contre, ces chiffres incluent l'effet PKP général tel que mesuré dans les deux plus récents sondages. Alors, est-ce le PQ peut gagner? Si les sondages disent vrais (en particulier dans la région de Québec), la réponse est non. Mais une partielle étant ce qu'elle est, une avance de 8 points dans les projections ne sauraient être aussi insurmontable (surtout que le PLQ a perdu un candidat vedette) Avec une participation plus faible et la CAQ pas dans la course (donc ses électeurs vont essentiellement rester chez eux mais certains pourraient voter anti-PLQ), le PQ a une petite chance de créer la surprise. Si cela devait arriver, ce serait une grosse victoire pour PKP. Je dirais qu'un résultat au-dessus de 30% serait une bonne performance pour la formation souverainiste. Au final, la logique voudrait que les deux élections partielles de ce soir ne fournissent pas beaucoup de suspense et que tant la CAQ (dans Chauveau) et le PLQ (dans Jean-Talon) conservent leurs acquis. Une surprise n'est cependant pas hors de question. Quoiqu'il en soit, ces deux partielles devraient nous permettre de mesurer l'effet PKP (ainsi que l'effet de perdre des candidats vedettes pur le PLQ et la CAQ). Earlier this week, I wrote an article for the magazine L'Actualité. This article was written during the previous week-end and was mostly a "what's the current situation" 5 months before the next election. This week however, we got a couple of new polls. First of all, the new Nanos (which is a rolling average over multiple weeks) finally agreed with the other pollsters by showing the NDP closer to 30% than 25%, the new Ipsos had all three parties within 1 point while the latest Abacus had the CPC slightly ahead of both the NDP and LPC. And today, the newest Ekos poll actually places the NDP first. 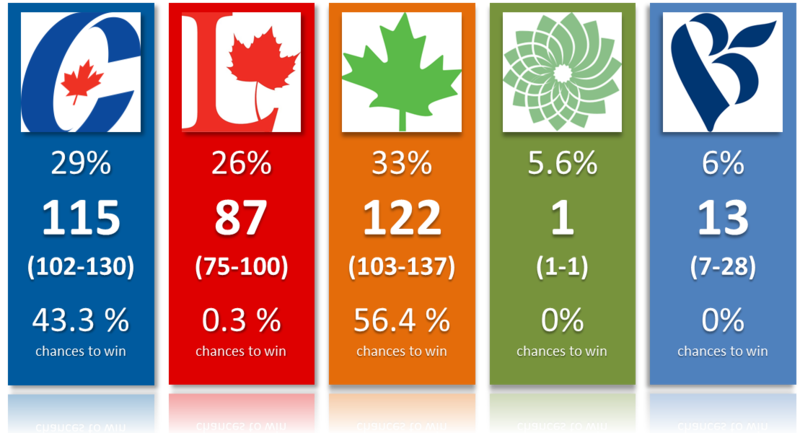 If you do an average of all these polls, you get projections very similar to the one from l'Actualité. Basically, it's a 3 way race with the CPC as favorite to win the most seats and the NDP favorite to finish second. But technically, all three parties could win the most seats. However, let's focus only on the recent Ekos poll. This is by far the best one for the NDP and the only one to actually put this party ahead. So it's interesting to see what could happen if Ekos was right. If we use this poll only, we get the following projections with, in order, the voting intentions, the seat projections with the 95% confidence intervals as well as the chances of winning the most seats. Detailed projections are here. You can also use the simulator. As you can see, the vote efficiency of the CPC wouldn't be enough to prevent the NDP from winning. Remember that I'm only using the Ekos numbers and this poll is the only one putting the NDP as high in Ontario in particular. This helps Thomas Mulcair quite a lot since winning the most seats while finishing 3rd in Ontario is definitely difficult. Notice as well that based on this poll, the Liberals would actually have no chance to form the government. There again, other polls don't put Trudeau so much behind. A majority seems out of reach of every party. It shouldn't be too surprising. If you are polled around 30%, even if we account for a possible underestimation by these polls, it's still way too low to get 169 seats. Let's forget the exact numbers for a moment and look at the big picture. The NDP is currently enjoying a massive boost from the NDP win in Alberta (if you think it's something else causing this small orange wave, let me know). And while it might not last until October, all signals are green for the NDP. Harper's satisfaction numbers are low, Trudeau is free falling and pretty much every poll shows that the NDP has the highest vote ceiling (i.e: people who could vote for the NDP). Plus, Quebec is all but guaranteed (at this point at least) to provide the NDP with a massive head start in term of MPs (unless the Bloc miraculously bumps back up, a lot of seats are very safe for Mulcair in la Belle Province). Also, I said it before and I'll say it again, but I expect Mulcair to do a good campaign, especially during the debates. The CPC won't crash and burn. This party has a core base of voters who will go out and vote on election day. I can't really foresee Harper getting anything less than 30% of the vote. No Prentice collapse in my opinion. On the other hand, getting 39% of the vote again might be out of reach. So the Tories are probably the easiest party to project. The question is really how will the NDP and LPC split the remaining votes. I think in particular that a lot of people are really looking for a "Anything but Conservative" way of voting. If the NDP can remain that high and so much ahead of the Liberals. this party will become the de facto ABC vote and that could hurt the Liberals tremendously. Trudeau really needs to do something as he can't afford to start the next election so much behind.